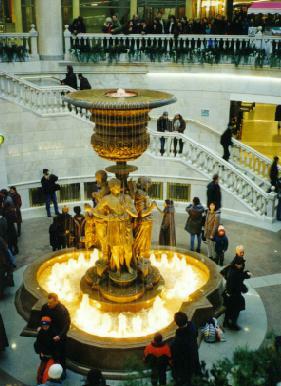 After leaving the Kremlin, we went into a beautiful, modern, multi-level mall. A moat is being built around the mall. It didn't have water in it, but I think it was going to be filled from the Moscow River. Bronze statues of characters from Puskin's stories were in the moat: the Firebird, a bear slapping a fish out of the water, and things like that. 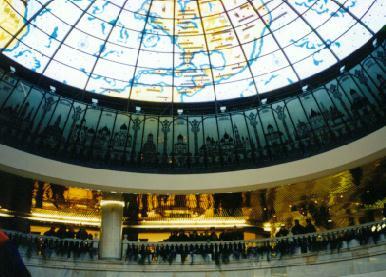 The dome is a stained-glass map of the northern hemisphere. We bought little meat-filled rolls, coffee, and hot chocolate at a small restaurant. This was their style of fast food. The girls at the counter couldn't speak English, but they did know to give us English menus.